Which Planner Layout Will Make You More Productive? With the New Year looming ahead, you might be ahead of the game and already have your new planner. But if you haven't yet picked up a calendar to plan your time – you might be wondering which planner layout is best. It comes down to personal preference, of course, but each format has its advantages. Personally, I now use a two page per week layout. However, I have tried them all and here are some things to consider as you head out the door to buy your paper companion for the next 365 days. Planners generally come in a few standard layouts. The one page per month is one of the most simple calendar layouts. This is free calendar material – the kind that banks, stores, and charities will send you for free at the end of the year. They are also in abundant supply as printables online. And actually, they do make sense to print out because they only take 12 sheets of paper – one for each month. You can hang them on your wall or keep them in a desk drawer and they are great for getting important information in one quick glance. The downside is that space is limited because you can only write so much in the one little box that you are given for each day. I like to use these as “working” calendar pages. Perhaps for my editorial calendar or to plan out a project and brainstorm ideas and timelines. Once my planning is final, I will transfer the info into my real planner and toss my one page per month calendar pages. So, hang onto those free calendars and use them as a planning board throughout the year. A two pages per week calendar layout is just what it sounds like – seven days of the week are laid out across a two-page spread. Usually, this style of planner also has a one or two page per month spread at the beginning of each month as well. I have seen these in both a vertical format (what I think of as Erin Condren's signature layout) and in a horizontal layout. Right now, my planner layout of choice is a vertical 2 page per week spread. I like the 2 page per week concept because I can see the whole week at once. This way, I know right away if one day is busier than another and can then adjust what I have to do accordingly. If Wednesday is jam packed I can then run my errands on Thursday instead. The two page per month spread at the beginning of each month can be a bit redundant, so I don't use this section to duplicate information and appointments. Instead, I use it to keep track of when I publish an article on my blog and send out newsletters. I actually give myself a little star sticker every time a post goes up. I am also toying with the idea of using this space as an editorial calendar as well – but I think I'll probably go a little more techy with that. A one page per day planner layout gives you one full page for each day. You also get the two page per month at the beginning of each month too. I started this year with a one page per day planner (the Kathy Davis collection from DayTimer is really pretty) and I liked all the space that it gave me to jot things down. This was actually downsizing from the two page per day planner layout that I used last year but it was still too much space for me. I liked having so much space to write notes and pretty much brain dump, but I found that it actually made me a bit disorganized. Not being able to see the whole week at once complicated things for me. I had to turn pages to find the notes that I was looking for versus looking at a two page spread and picking out the exact detail. I am also big on using colorful sticky notes and stickers to grab my attention, and these work perfectly on the two page per week planner layout. A few years ago, I thought that the two pages per day planner layout was perfect for me. In fact, I stuck with it for two years (also because I love the Blooms planners by Franklin Covey, which have just been redesigned) which was much longer than I should have. The bottom line is that I just didn't have enough to write about every single day to fill up 2 pages. So, many of my days were just blank. When I needed something that I wrote down, I would really have to dig and flip through tons of pages to find the exact note. Also, the more pages that you have in your planner, the bulkier it becomes. For the one or the two page per day planner layout I had to put just a few months in my binder and not the whole year. Which Planner Layout Is Right For You? 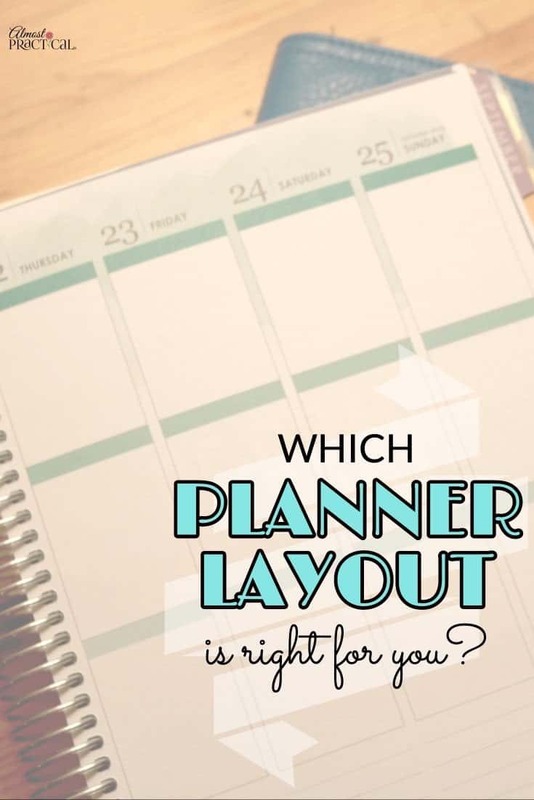 With so many choices it is hard to figure out which planner layout is right for you. grabbing your info in a quick glance. For me, the two page per week vertical planner layout by Erin Condren is perfect (you can even get these at Staples). Which one will you be choosing in the upcoming year? Tell us in the comments below. My best friend — despite the fact that she works completely online — is a big fan of these planners. God, these planners are so not my thing. I just can’t seem to carry anything physical with me. There’d be a day when I’d find carrying my laptop would be a pain too.